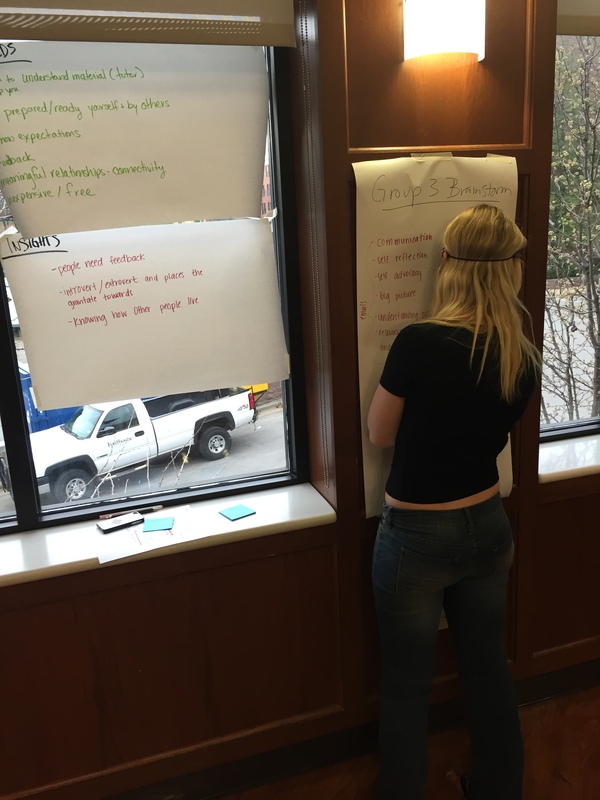 Last week I attended a session at Fontbonne University called “Design Lab.” The session brought stakeholders from around campus together to engage in a process called design thinking. If you’re not familiar with design thinking, it originated from the Stanford Design School and the design company IDEO (read about it here and here). The basic process relies on a few basic steps: empathize, define, ideate, prototype, test. It’s a cycle that allows people to break away from the confines of a problem and move toward workable solutions. The important part is it’s not just for designers; anyone can utilize this process to generate innovative ideas. That’s exactly why I went to Fontbonne University to check out the design thinking process, because I think it’s perfect for education. Teachers are naturally good at design thinking because they can empathize with different perspectives of a problem. Yet sadly as a teacher I hear a lot of complaining about problems in schools, but see little action to fix them. Teachers need to learn how to model the type of problem-solving skills that are a key component of 21st century learning. After a brief chat, the event organizers gave an overview of the 90 minute rapid-fire version of design thinking as well as some background on the proposed question. In this way, the interview can gain a sense of another’s feelings within the context of the larger problem at hand. 2) Define: The second, and a critical but often overlooked step, is to actually define the problem. With a different perspective in mind, you can clarify what the main issue is by identifying the key insights and needs from each person’s interview. We had to synthesize all these as a group onto a large sheet of paper. 3) Ideate: With the insights and needs posted on the wall, the next step was to come up with solutions. It didn’t matter how off-the-wall or unlikely they were, the point was to joint out everything that came to mind. From this large list, each person had to choose three that they thought could be useful in addressing the problem. My fellow group member writing out all the solutions. 4) Prototype: With three solutions in mind, the groups separated and then reorganized by letter on our name tags. So, with new group members each person had to share the three ideas their former group had brainstormed. From that, the group needed to come up with a pitch for one solution. For our group, that meant combining different ideas into a single solution. Each group then pitched the idea to the whole group to decide on one solution to move to the test phase. 5) Test: The final step (albeit not the end of the process by any means) is implementing a solution and then tracking its effect on solving the initial problem. Fontbonne now has different ideas and it’ll be exciting to see how they work to fix equitable access for all students. After going through the process, I know that design thinking has huge applications for schools. I can’t wait to try it out on my campus and see what can be accomplished! Imagine how design thinking could improve… grading systems, school behavior policies, professional development, technology integration, parent communication, innovative teaching practices, learning space design and the list goes on and on! I hope to spread design thinking as a process that empowers people to find solutions, instead of focusing on problems as insurmountable obstacles.